SUPER BRIGHT ＆WORK LONG TIME - 500 lumens brightness. Beam distance about light over two football fields 656ft high power.Full light up to 3Hrs, Half light 6Hrs. Powered by 2600 mAh 18650 rechargeable battery (included). LIFE HAMMER - Life hammer Hidden in the tail of the flashlight. When an emergency occurs, such as fire disaster or trapped in the car. You can rotate it out and crush the glass window to escape. MULTIPLE FUNCTION - 5 light modes,High - Medium - Flash - Off. Press Switch 2 seconds, SOS light open up. Rotate the lamp head to adjust beam width. SMART DESIGN - Pls charging in time when the power indicator move to red light. Input: battery recharge with a computer besides charger. Output: as a power bank charging for mobile phone and other digital devices. TOUGH RELIABLE - IP44 waterproof and designed for using in heavy rain. 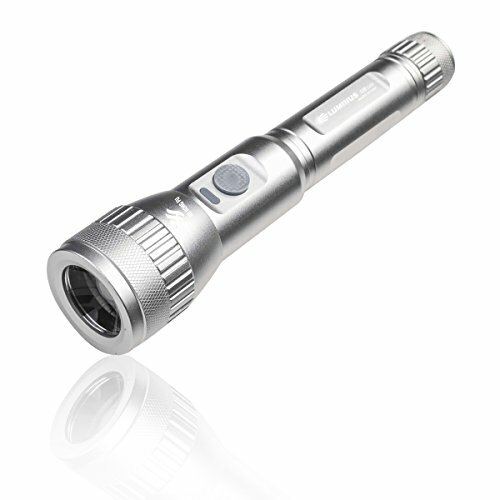 It is durable aluminum body and shock-resistance endure rough handing.